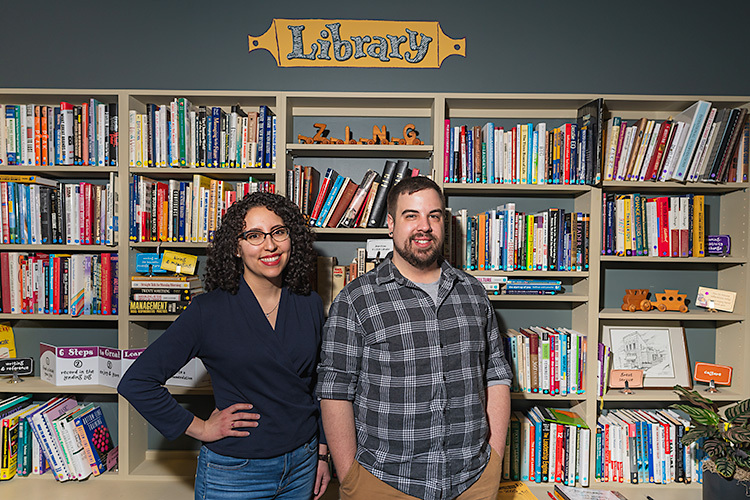 A local teacher’s focus on conversation in her Spanish program has translated into extraordinary success for her students. 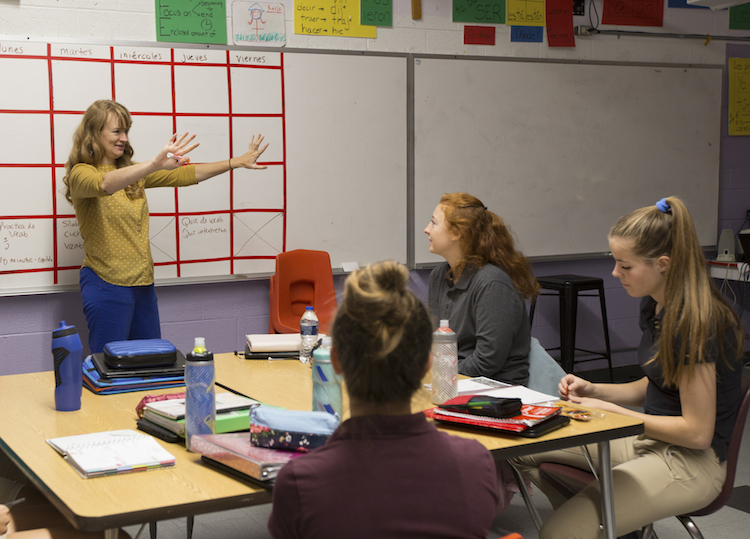 April Dice, 44, from Clare, Michigan, teaches Spanish at Sacred Heart Academy (SHA), a K-12 Catholic school located on E. Michigan in Mount Pleasant. Dice and her husband Jeff, 48, have five children: Camden, 21, Mason, 18, Karis, 15, Ellie, 13, and Riley, 9. Originally a history education major, Dice learned Spanish in Costa Rica as part of a mission trip to work in Nicaragua with her family. Dice said when she returned from the trip she received a call saying that there were no applicants for a Spanish teacher position. While on her trip, a law passed in Michigan requiring students to take two years of a foreign language. She did an emergency certification for the job and later went to Saginaw Valley State University for a Spanish minor. Today Dice teaches a Spanish program with a unique approach: communication is the primary focus. Spanish students listen to their teacher, April Dice, make announcements at the beginning of class on Monday, Oct.8, 2018. Contrasting from her own experience in Spanish classes growing up, Dice teaches her classes 90 percent in Spanish and only 10 percent in English. Mary Kay Yonker has been SHA’s Principal for three and a half years. Yonker has one daughter that has gone through April Dice’s Spanish program and is now in college and two that are currently in the program. “I can’t believe it. They have conversations around me at home in Spanish,” Yonker said. “And the parents love that the kids can actually speak the language.” Other parents and students agree. Christine Evans, 18, and Scout Nelson, 18, share a book needed for an assignment during class on Monday, Oct. 8, 2018. Evans and Nelson are both seniors at Sacred Heart Academy Catholic school and are in their fourth year of Spanish classes. Angie Reid’s two daughters Emma, 15, and Anna, 18, are both in Dice’s Spanish classes at SHA. Reid believes the focus of conversation is a key feature of the program. “They go down, get coffee, and have a conversation in Spanish and it’s that constant use of the language that I really think sets our program apart from so many others,” Reid said. Reid says Anna, who is a senior, is going to Saginaw Valley State University next year to pursue a Bachelor of Science in Nursing (BSN) and minor in Spanish. Scout Nelson, 18, is also a senior at SHA, and is currently in her fourth year of Spanish classes. 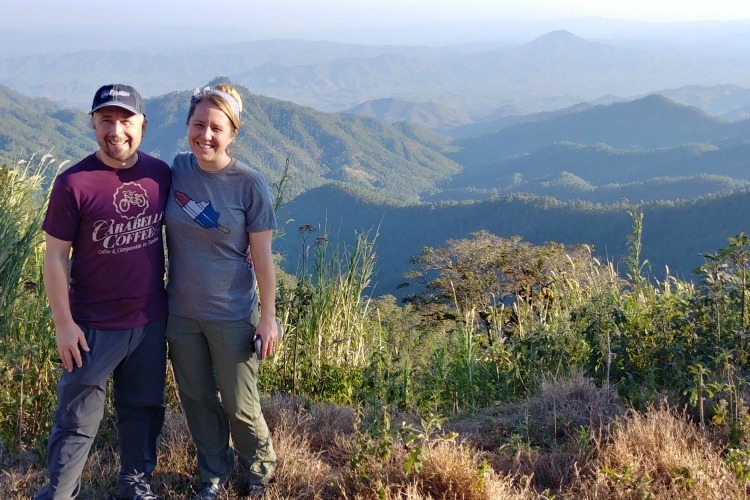 Growing up, Nelson’s family went on mission trips teaching English in Spanish speaking countries, but Nelson would encounter language barriers. Nelson’s boyfriend’s family are Peruvian and she’s now able to communicate with them more. 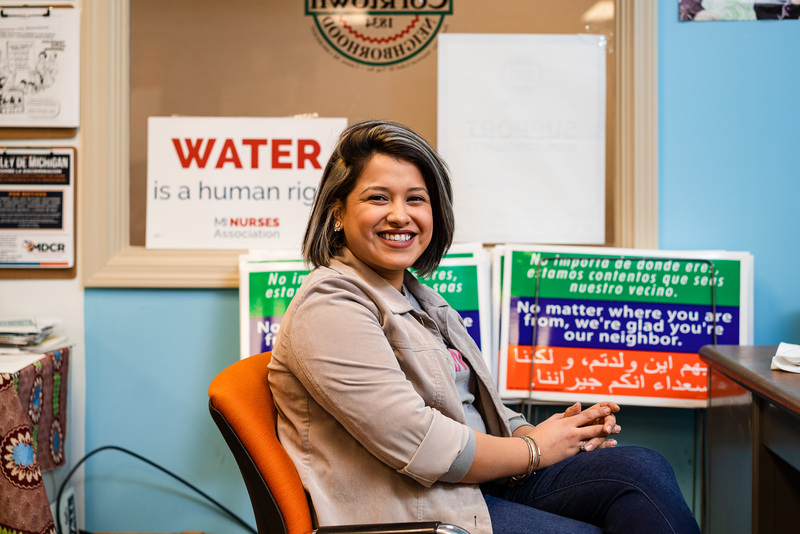 She hopes to use her Spanish skills more professionally as a nurse where she can communicate with people she may otherwise have trouble understanding. 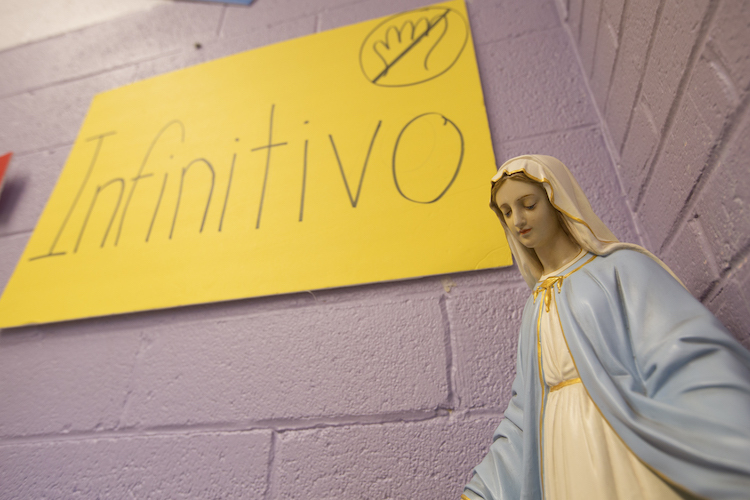 An Our Lady of Grace statue stands in the corner of April Dice's Spanish classroom at Sacred Heart Academy in Mount Pleasant, Michigan.Each summer Dice takes students on mission trips to Spanish speaking countries. This year they are looking at either Costa Rica or Puerto Rico. 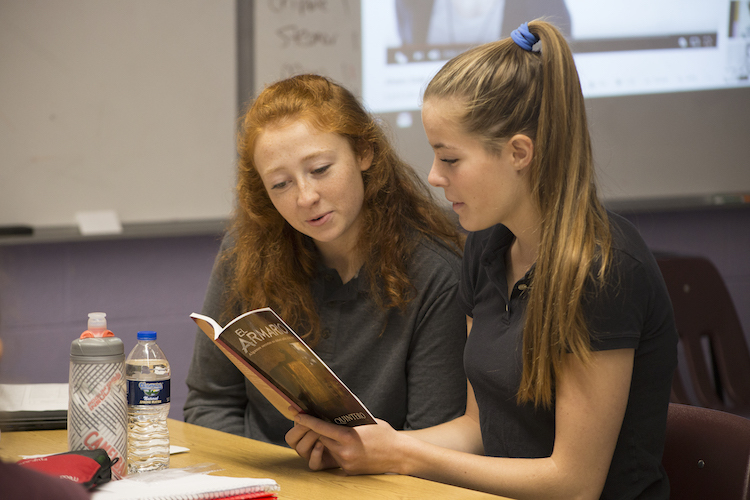 Yonker said that after taking the Spanish program at SHA, some alumni that are now in college have been able to test out of multiple Spanish classes, ultimately saving time and money. 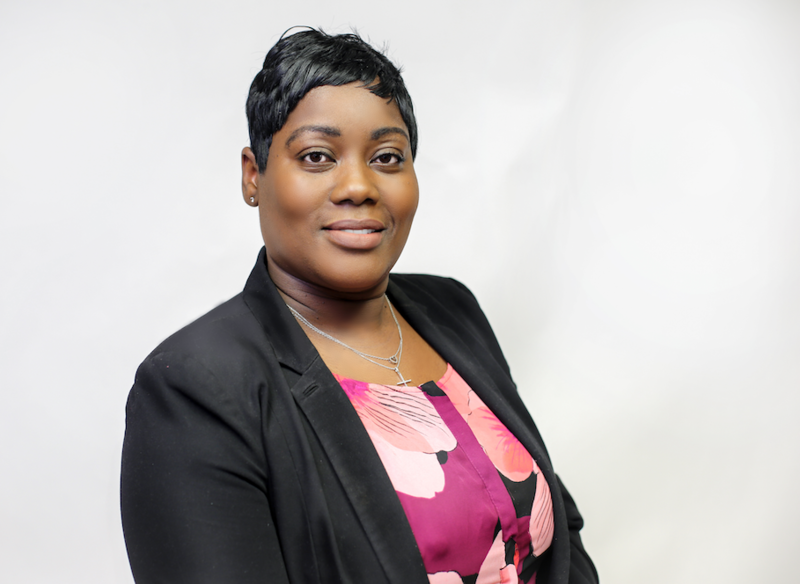 Though it is a requirement in schools, according to Dice she believes special education and foreign language are two areas where there is most need for more teachers. Many schools are having to transfer to an online language program due to a lack of teachers. Dice said it’s her goal this year to continue working hard to constantly communicate in Spanish, even though something may be much faster or easier to communicate in English.